Why can't Britain build enough homes to meet demand? With the average price of a house now just over £200,000 and rents in the private sector soaring in parts of the country, many observers argue that the UK is in the grip of a housing crisis. In London in particular, entire developments containing hundreds of flats are often sold before construction has even begun. The failure to build enough homes means that millions of people are stuck renting when they would rather be living in a home they own. The housing charity Shelter says the shortage is "enormously damaging, socially as well as economically" and is forcing a quarter of those aged under 35 to stay living with their parents. 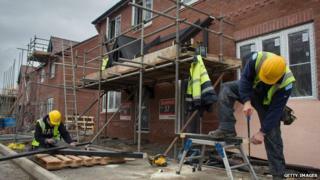 Just 125,110 homes were built in England in the year to March, according to government figures. That is about half as many needed to keep up with demand, and the problem is compounded every year. The National Housing Federation estimates that compared with demand, there is now a shortfall of more than half a million dwellings. So why can't the UK build more homes? While it's a multi-headed hydra, the financial crash of 2007-08 bears some of the blame. The turmoil meant that banks stopped lending money, so buyers couldn't get mortgages. That meant builders could not sell as many houses, forcing them to construct far fewer. The downturn prompted about 250,000 people to leave the construction industry, says Patrick Law, corporate affairs director of Barratt Developments, one of the UK's biggest house builders. Now that demand has returned, there is a skills shortage, with bricklayers, carpenters and joiners in short supply. The Federation of Master Builders' chief executive, Brian Berry, asks: "How much stronger would the pace of growth in the UK construction industry be if we had an ample supply of skilled trades people?" The Local Government Association agrees. "We've trained too many hairdressers and not enough bricklayers," says chairman, Gary Porter. Despite the skills shortages, the number of homes being built by the private sector has risen sharply in recent years. Barratt is building more than 14,000 houses a year, with the completion rate now 40% higher than it was in 2011, Mr Law says. Its competitor Redrow completes about 4,000 houses a year. Chief executive John Tutte says the company is selling them at the same pace it did at the peak of the market in 2007, but is doing so from far fewer sites. He says negotiating the planning system continues to be a major hurdle for builders. Even if permission is granted for a site, a council can impose dozens of conditions that must be addressed before construction can start. Delays are also created because most councils' planning departments are under-staffed, according to Mr Tutte: "The government is not saying they have to increase funding for planning - it's still a big frustration." The government has speeded up the planning process by cutting 1,000 pages of policy to just over 50, housing minister Brandon Lewis told the BBC. He says that a record 261,000 planning permissions were granted last year, with 75% of decisions on major applications made on time: "We are taking action where planning authorities consistently make fewer than 50% decisions on major applications on time." The planning system is also a concern for Barratt, and Mr Law says it remains the biggest obstacle to the industry building more houses. It took the company about five years to secure approval for the Cane Hill development in Coulsdon, near Croydon in south London, where up to 675 homes and a Waitrose supermarket will be built on the site of a former mental hospital. The final obstacle was not removed until March when the High Court rejected an application for a judicial review of the development. While Mr Law says it is up to house builders to "make the case for a development and the benefits it can bring", John Stewart of the Home Builders' Federation argues that it is often the "well-heeled and the well-housed" who indulge in 'nimbyism' by opposing new developments on their doorstep. Yet it is often the very same people who bemoan the inability of young people to get on the housing ladder, he adds. Following the dramatic decline in construction by councils in the past three decades, housing associations now provide accommodation for millions of people. Many build properties for sale or rent at market rates as well as offering shared ownership and affordable rents. However, measures announced in the Budget in July to cut rents by 1% over the next four years will reduce their income and force some housing associations to slash development plans. David Orr, chief executive of the National Housing Federation, which represents housing associations, says: "At the very least 27,000 new homes will not now be built, though that figure could be much higher." Giving those who rent from housing associations the same "right to buy" as council tenants will only make the problem worse, he adds. Housing associations built almost 24,000 homes in 2014 and reducing that number will do nothing to cut the £25bn a year bill for housing benefits, says Pete Jefferys of Shelter - even though that is precisely the government's aim. The charity believes that more public investment in the social housing sector is the only answer to the UK's housing crisis: "If neither local authorities or housing associations build homes in significant numbers, then we will never build the homes we need." At the current rate of construction, the housing shortfall in London will reach more than 700,000 homes in just 16 years. As the National Housing Federation argues, bold solutions are needed to solve the UK's housing crisis.